Access to the Saratoga NY Region is one of the many reasons that retirees are attracted to Eddy Senior Living. Just a short drive from all our communities and easily accessible via public transportation, Saratoga offers seniors a vibrant arts and culture scene and variety of things to do. Learn more about this historic city and discover all the benefits of retiring near Saratoga. The Saratoga Performing Arts Center, often referred to as SPAC, is a concert and performance center in Saratoga Springs NY. Located in Saratoga Spa State Park, the covered outdoor amphitheater hosts the Philadelphia Orchestra and the New York City Ballet every summer, as well as numerous other international dance companies, musical artists and world-renowned performers. 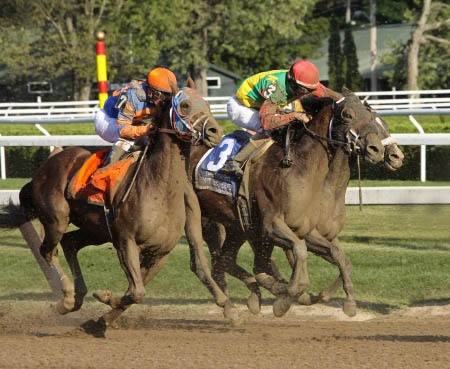 Often referred to as the “August Place to Be”, Saratoga is widely known for its thoroughbred horse racing. Open in late July and reaching its pinnacle with the Travers Stakes race on the last Saturday in August, the Saratoga Race Course is one of the oldest major sporting venues of any kind in the country. Even if betting on the ponies isn’t your thing, there is truly something magical about spending a day at the races. Hit it big at the Saratoga Casino Hotel! Located in Saratoga Springs NY, the casino features 1,700 slots and electronic table games, as well as live harness racing, simulcast wagering, restaurants and live entertainment in the Vapor Night Club. There is also a 117-room luxury hotel on the property. With more than 20 golf courses in the area, Saratoga is a retired golfer’s paradise. Saratoga Spa Golf Course, Saratoga Lake Golf Course and Saratoga National Golf Club are just a few of the beautiful, award-winning public golf facilities you’ll enjoy in Saratoga County. Most courses also have a pro shop, driving range and professional instructors on staff. Saratoga is a historic town, and home to a number of museums and historical sites. Visit the Tang Museum for art, or spend the day at the National Museum of Dance. Organize a tour of the Saratoga Automobile Museum for your senior group, or learn about the history of horse racing at the National Museum of Racing and Hall of Fame. From food fests to fireworks, there’s no shortage of things to do in Saratoga NY. The Victorian Streetwalk kicks off the holidays each year on the Thursday after Thanksgiving, followed by the annual First Night celebration every New Year’s Eve and Chowderfest in early February. In the fall, there’s the Adirondack Balloon Festival in nearby Queensbury, and the LARAC arts & crafts festival in Glens Falls is a favorite each spring. Foodies have their pick of more than 100 restaurants, many of them run by top-notch New York City chefs who headed north to escape the hustle and bustle. From fine dining at the Adelphi Hotel to Esperanto’s infamous doughboys, Saratoga has hundreds of restaurants and eateries for nearly every culinary taste and budget. The historic downtown shopping district is also home to dozens of lovely boutiques and specialty stores, and you’ll find all the major name brand retailers in and around Wilton Mall. 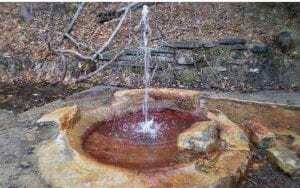 Among the few naturally carbonated springs in the United States, Saratoga’s mineral springs are revered for their healing properties and cur ative powers. Purported to clear skin, aid in digestion and even strengthen the blood, there are 21 public mineral springs throughout Saratoga for collecting drinking water, as well as several spas offering stress-relieving mineral baths and soaks in the Spa City’s emerald green water. St. Peter’s Health Partners provides high-quality healthcare services to seniors in more than 165 locations across the Capital Region, including St. Peter’s Primary Care on Church Street in Saratoga Springs and Saratoga Family Practice located at Maple Dell. Those who retire near Saratoga have access to more than 12,500 health care professionals across the region, as well as multiple state-of-the-art hospitals. According to AARP, college-towns have become popular retirement communities, thanks in-part to the abundance of post-retirement jobs and continuing education opportunities. With two local colleges, Skidmore and Empire State, Saratoga is a hot spot for retirees. The Saratoga Race Track and Saratoga Performing Arts Center also provide many seasonal, part-time jobs for seniors. If you are looking for senior living communities near Saratoga, consider Eddy Senior Living. All of our independent senior living communities, enriched housing/assisted living and memory care communities are located near Saratoga NY. For more information, contact us or call (877) 748-3339.